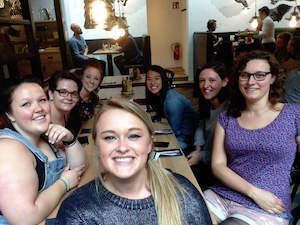 Women in Engineering Summer Program in Austria – Before coming to Austria, I was super nervous and very excited. I didn’t really know what I was in for and kept a very open mind. After arriving, I’ve been having a blast! The girls are all wonderful, there is 31 girls from 12 different countries. The lectures have been really good as well, we had one on current medical technologies today and it was definitely my favourite. Being a recent graduate of the architectural engineering program, I’ve been absolutely loving the architecture and history behind it as well. I also loved visiting the lake and some of the neat hands-on labs that we’ve gotten the ability to test out. We’ve tested our DNA and created silicone models of different body parts. Having the weekend to ourselves was really great, it gave us the chance to explore other parts of Austria and Germany. My group went to Salzburg for the weekend and visited a fortress and the catacombs. We checked out the Mirabell Gardens as well, which was in a scene from the Sound of Music. It’s hard to believe that tomorrow is closing ceremonies, and that these two weeks have already flown by. I’ve learned a lot and I’m really going to miss these girls. I think I’ve made some good friendships during my time in Austria and I can’t wait to keep in touch.